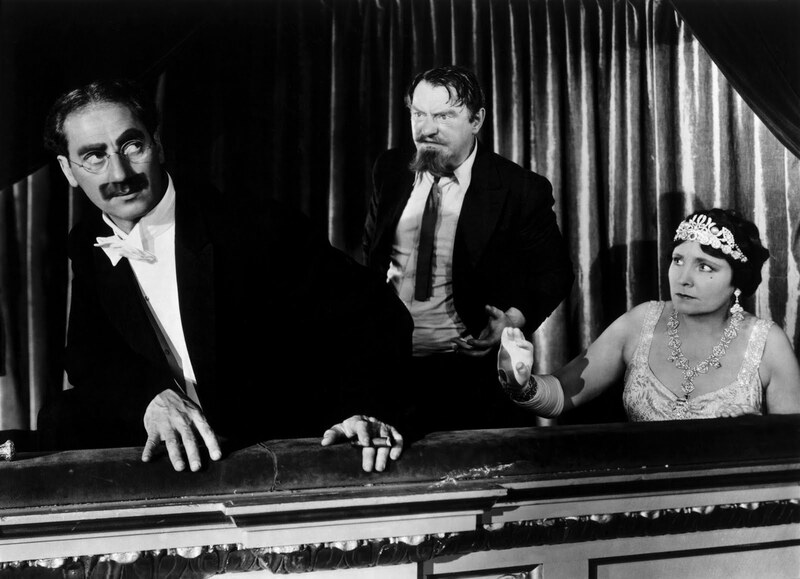 Critics usually contend the greatest Marx Brothers film to be either Duck Soup (1931) or A Night at the Opera (1935). The debate between the two stems from many reasons -- Duck Soup is arguably the brothers’ funniest picture, yet A Night at the Opera is their most famous. Both find their place on countless cinema scholars “Top 10” lists, especially in the comedy genre. Where Duck Soup saw the end of the brothers’ partnership with Paramount Pictures (they made five films with the studio), it was also the final entry containing Zeppo, the fourth Marx who would retire the act after Duck Soup and continue his career as an incredibly successful theatrical agent and engineer (he basically invented the first FitBit in the late ‘60s). There are those that feel the Marx Brothers’ films at Paramount are the ones that best represent the comedy family in their honest form. Paramount didn’t tell them what to do, or work with them to conform to any specific artistic structure. The pictures were chaotic and anarchic, full of wild vaudevillian mischief and crass humor. But Duck Soup wasn’t a huge hit at the time of its release. Viewers lauded its political sentiments and timing during The Great Depression and it yielded a lukewarm reception. The Marx brothers temporarily went their own ways following its release. Chico and Groucho spent time on the radio, while Harpo expatriated himself to the Soviet Union for a time. Their time on film seemed as though it had may have run its course: their gags weren’t holding up anymore, and as performers not particularly adept at directing or writing, Marx trademark mischief was all they had. What happened instead was Irving Thalberg, head of MGM, brought them to the studio. MGM was rich and Thalberg was young -- he took over as part owner of the company at age 24, saw the production of over 400 films during his 12 year tenure with the studio, and died in his late 30s. MGM was a studio with strict procedural dictates and huge production values. It was not the type of place the Marxes were used to working, but as Duck Soup’s reception proved, something had to change if the boys were to remain in the spotlight. While some audience members never adapted to the modified style of the Marx Brothers’ partnership with MGM, the first production of the newly married couple, A Night at the Opera, is similarly revered as not only their best film, but one of the best films ever made. The film diminished the lawless “do anything for a laugh” mentality of their earlier pictures. But what it gained was a picture with greater emphasis on controlled storytelling. The cast was crafted to have no unnecessary characters, the narrative structure is strong, and each brother manages to shine with their trademark humor. Groucho still verbally assaults most people with whom he shares a conversation, Harpo’s silent boyishness pairs well with his unrestrained mischief, and Chico, ever Harpo’s partner, swindles and tricks his way through the film. It is signature Marx comedy with a more impressive stage. Thalberg had a stupendous grasp of audience desires at that point in cinema. He produced a tremendous number of hit pictures. A Night at the Opera contains less jokes than previous Marx films, but the design was that less jokes would equal more effective laughs. The reason was that between the jokes, a story would be told that allows the audience for root for and identify with the characters. The brothers packed in every bit of their zany tendencies the film would allow, while Marx regular Margaret Dumont, along with Kitty Carlisle and Allan Jones, drove the plot. No boring exposition is to be found; everything has a purpose. 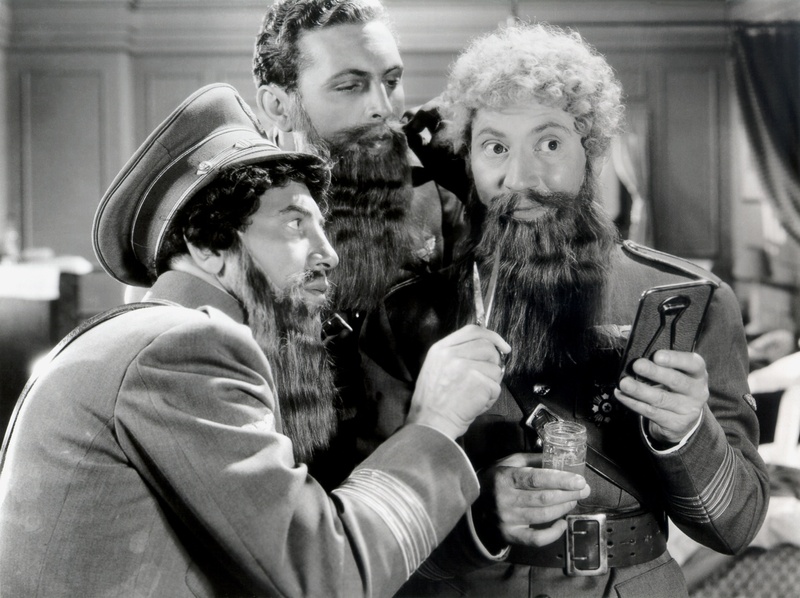 After all, Marx Brothers films were musicals, for all intents and purposes. MGM just permitted them to be top-tier musicals with well-produced songs. “Hooray for Captain Spaulding” was fun, but the connection with MGM allowed Marx Brothers films to contain songs that truly drew audiences of the day. The production code had formally been adopted one year before A Night at the Opera, imposing draconian restrictions on all cinematic content for the next few decades. The Marxes transitioned into this review easily, fearing little about their material being oppressed by the Hays mandates. With a high production value, a tight script with an accessible story, fine acting, great music, and classic Marx humor, it’s easy to understand why A Night at the Opera is revered as the brothers’ top film after all these decades. Their career withered a bit more with each subsequent film, further establishing A Night at the Opera as their pinnacle achievement.